Another gas stove, another passaround. 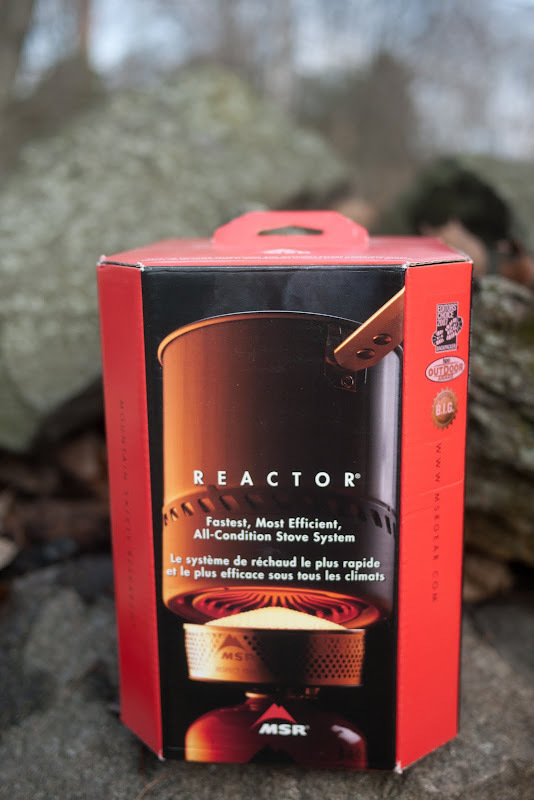 The MSR Reactor says it is the "Fastest, Most Efficient, All Condition Stove System" - reason enough for me to have a closer look at it, and organize a passaround! 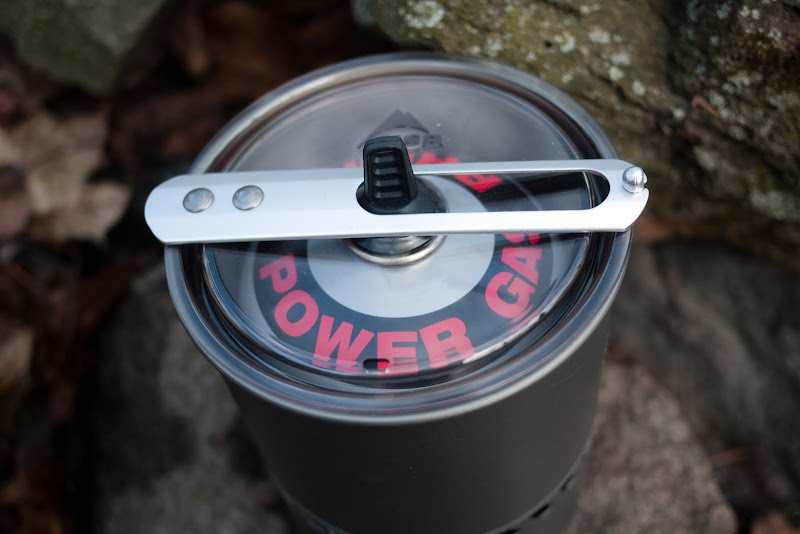 Makes a total of 485 g for the stove, pot, lid and cloth, or 849 g for the set with a full 230 g gas canister, which fits into the pot together with the stove. I don't put this down as ultralight, but it is light - especially in comparison with a Trangia, which is usually double the weight for the small set. MSR says the pot is fine for 1 - 3 persons, that is realistic if you eat ready-made meals and all you need is boiling water. The lid has a handy rubber grip and a steam hole, and the pot a long handle. It is a 1,7 l pot and has markings on the inside, but the max fill is 1 l which is a bit odd - maybe MSR wanted to make sure that nothing boils over. It also has an internal heat exchanger. 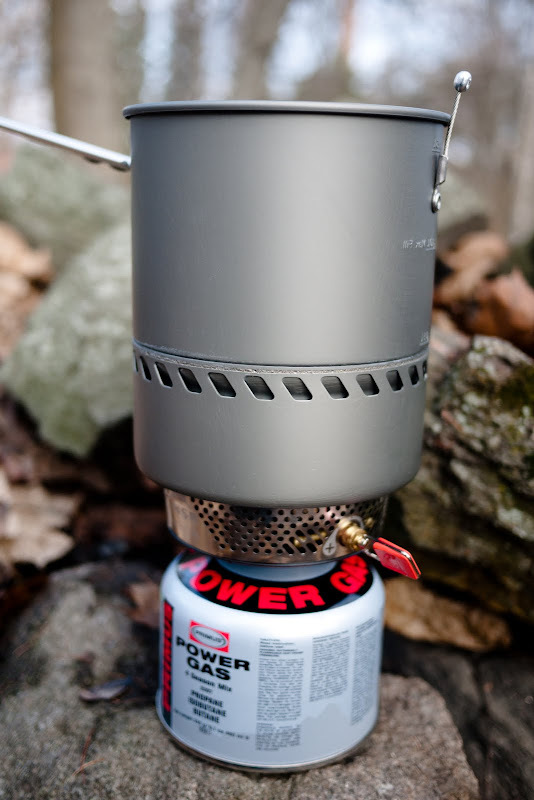 The stove is one solid, well-made piece and is screwed on the canister, with a tight fit. The Flame Adjuster has a piece of rubber, so you won't burn your fingers and it makes for easy operating with gloves. The pot closes tight with stove, cloth and a gas canister inside. The stove nestled on top of the cloth in the pot. 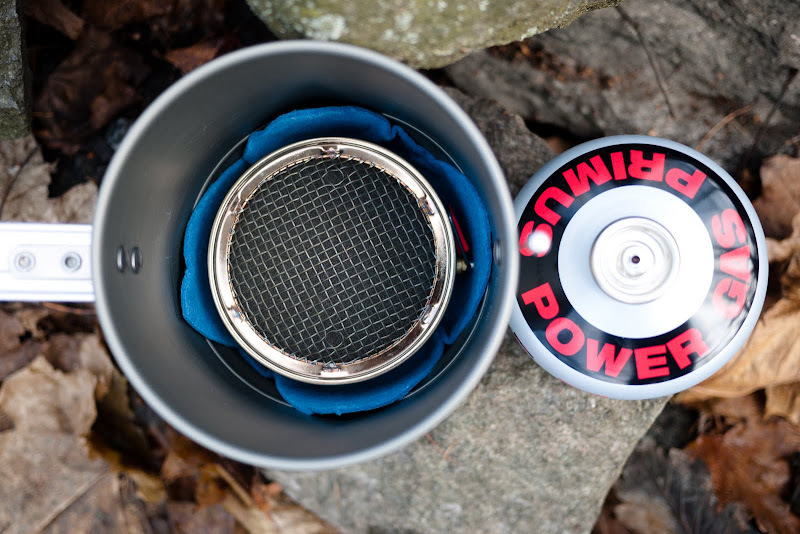 It is a nice compact system, and is supposed to be brutally fast - it should take between three and five minutes to boil a liter of water in real world conditions - something I will test in the upcoming video. 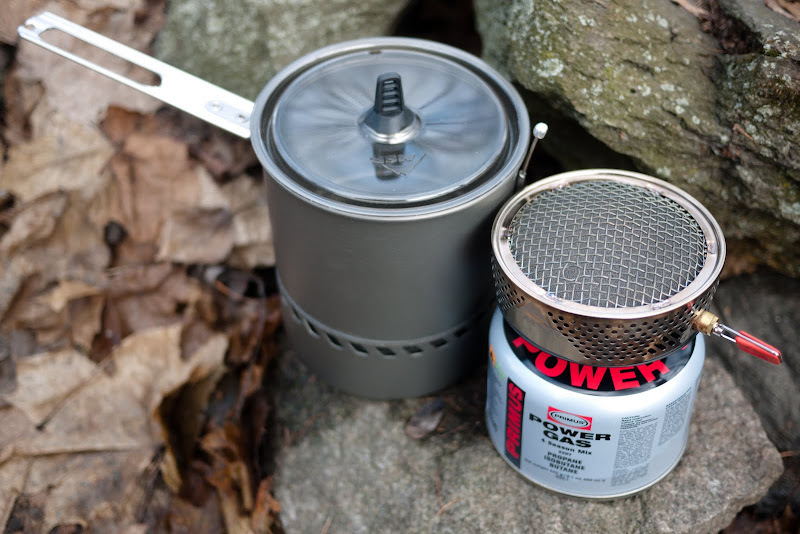 I think it is an excellent stove for those who need boiling water, and need it fast with as little fussing as possible. If you're planning to cook and simmer, I believe that should be possible as well - you can adjust the heat output. It also has the integrated wind screen with the pot, as well as the heat exchanger, a well thought out system if you ask me. Pot and the stove on a canister, ready for action. The whole system set up. I'd like to pass the MSR Reactor set around to five different readers and have them test it. If you're a total newbie to gas stoves like me or a seasoned veteran, anyone can apply for a test of the set. So how does this work? I send out the set to the first reader, and he gets to play around with it for two weeks. You need to have access to gas cartridges (I can't send those) and you need to be willing to pay the postage to send it to the next person, but besides that its completely free to you and allows you to test the stove without shelling out the money first. After your two weeks of playing you send the set forward to the next in line, and drop me a short email about what you thought of the set, which will be published here on the blog. In that way we can collect different viewpoints on the MSR Reactor, see how it performs in different environments, and get a nice review together. You want to take part in the Passaround? Great! What you need to do is leave a comment underneath (preferrably not anonymous), and next week Tuesday (13th of April) around noon I will randomly pick the five people who get to test the MSR Reactor. While I'd love to have this Passaround open to everyone, sending packages, even small ones like these, is expensive, so I'd would like to limit it this time to Europe, with a preference for Scandinavia and the Baltics. Before you hit the comment button, I'd like to remember you - you should be able to get a gas cartridge for the test in your town, you need to be willing to pay the shipping costs to the next person, and you're fine with sending me a short statement of your opinion with a photo or two. If that sounds like a good deal to you, please comment! And in case you say "That's all I needed to know, thanks!" and want to buy one right away, Ultralight Outdoor Gear has a good offer for the MSR Reactor at the moment, and their service is outstanding, so a good recommendation if you don't want to wait for the outcome of the Passaround.